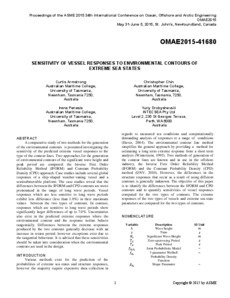 A comparative study of two methods for the generation of the environmental contours is presented investigating the sensitivity of the predicted extreme vessel responses to the type of the contour lines. Two approaches for the generation of environmental contours of the significant wave height and peak period are compared: the Inverse First Order Reliability Method (IFORM) and Constant Probability Density (CPD) approach. Case studies include several global responses of a ship-shaped weather-vaning vessel and a semisubmersible platform. The case studies reveal that the differences between the IFORM and CPD contours are more pronounced in the range of long wave periods. Vessel responses which are less sensitive to long wave periods exhibit less difference (less than 1.0%) in their maximum values between the two types of contours. In contrast, responses which are sensitive to long wave periods show significantly larger differences of up to 7.0%. Uncertainties also exist in the predicted extreme responses where the environmental contour and the response isoline behave tangentially. Differences between the extreme responses produced by the two contours generally decrease with an increase in return period; however exceptions exist due to the tangential behaviour. It is advised that these sensitivities should be taken into consideration when the environmental contours are used in the design.